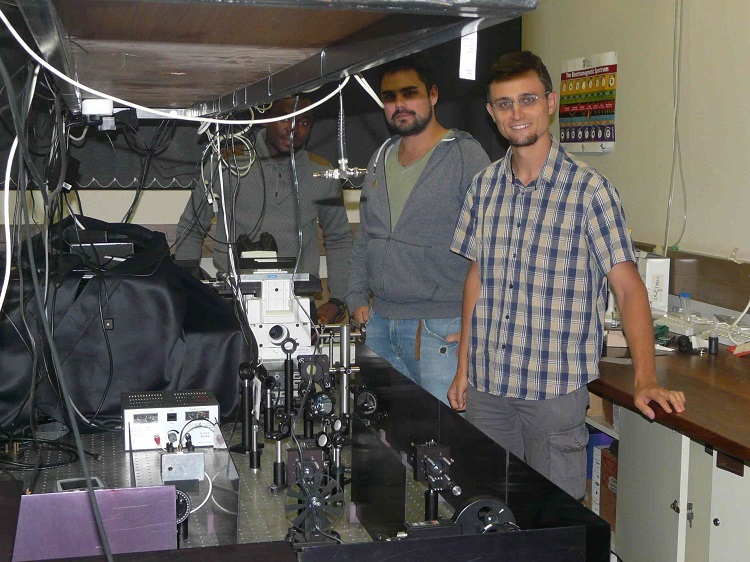 Early in 2014 Dr Tjaart Krüger, Senior Lecturer and Head of the Biophysics and Photonics Research Group in the Department of Physics at the University of Pretoria (UP), was awarded R1,5 million by the NRF to build a new piece of equipment. The award was made from their National Equipment Programme and UP contributed a further R940 000 towards the project. At that point Dr Krüger's laboratory contained only an optical table. He decided to build the new equipment from scratch – for the fun of it, the experience and the opportunity it offered for student training, but, more importantly, to introduce to the world an altogether new type of single-molecule spectroscopy and a facility with a high degree of versatility. Moreover, a lot of money can be saved by building your own specialised equipment. Dr Krüger explains that he had come across only one company that sold single-molecule spectroscopy equipment, but that its versatility was limited and the price was at least five times more than he would have to spend on developing his own. Now, after three years during which tremendous help was received from talented students who put a lot of time into the development of their own software, the equipment is finally working. It consists of more than 100 components purchased from more than 15 different suppliers. The key components are a special type of laser, a state-of-the art microscope and three single-photon detectors, all of which are finely synchronised to the level of the arrival time of individual photons. The laser, which was acquired through the National Laser Centre At the CSIR's Rental Pool Programme, is a broadband supercontinuum pulsed laser. It produces pulses of any colour in the visible and near-infrared regions of the electromagnetic spectrum. The pulses last only a few picoseconds (10-12 s), which means that one can assume that when the laser interacts with a sample of interest, the absorption of the photons will be instantaneous. This cutting-edge experimental setup is the first of its kind in Africa. It is sensitive enough to measure individual photons that are emitted from individual molecules. Together with Dr Krüger's research group and an international network, the team will use the equipment to obtain incredibly detailed information about interactions and energy transfer processes between the building blocks of biological cells. At the moment Dr Krüger focuses mainly on the light-harvesting proteins of photosynthetic organisms to understand the fascinating design principles of these miniature solar cells and determine how living cells protect themselves against intense light and other stress conditions. He is currently involved in encouraging members of the South African scientific community to use the equipment to study important diseases at the level of single proteins and single DNA. Collaborating with colleagues in the Department of Physics, the team have started to explore the fascinating properties of individual semiconductor and metallic nanostructures and plan to proceed to investigate their interactions with proteins – a study that has potential applications in solar energy and medicine. The equipment will also be used for some fundamental physics applications, such as investigating the peculiar phenomenon known as quantum entanglement. Why is it called single-molecule spectroscopy? As indicated by the name of the equipment, Dr Krüger and his team can examine one molecule at a time, which gives them access to a vast amount of information about virtually any biological process at the most fundamental level. By time-tagging individual photons emitted from individual molecules the instrument is equipped with exquisite sensitivity and selectivity. This technique enables them, for example, to quantify molecular dynamics, properties and interactions in material, health and life sciences. Such a wide field of research requires a flexible instrument that can be adapted to suit individual needs to analyse a multitude of parameters down to the single-molecule level. 'Our equipment brings together disciplines such as physics, chemistry, biology, electronics, and information technology. Being exposed to our multidisciplinary setting opens numerous doors for students, since most work environments outside academia are multidisciplinary,' says Dr Krüger. Dr Krüger gave the assurance that the commissioning of the equipment does not mean that the team would stop developing it. 'We have built it in such a way that basically only our imagination is the limit. We will continue to develop new ideas and create many exciting research projects. We already have a few ideas that we would like to patent,' he said.